We want to replace the 3 lines inside the boom before we get going. 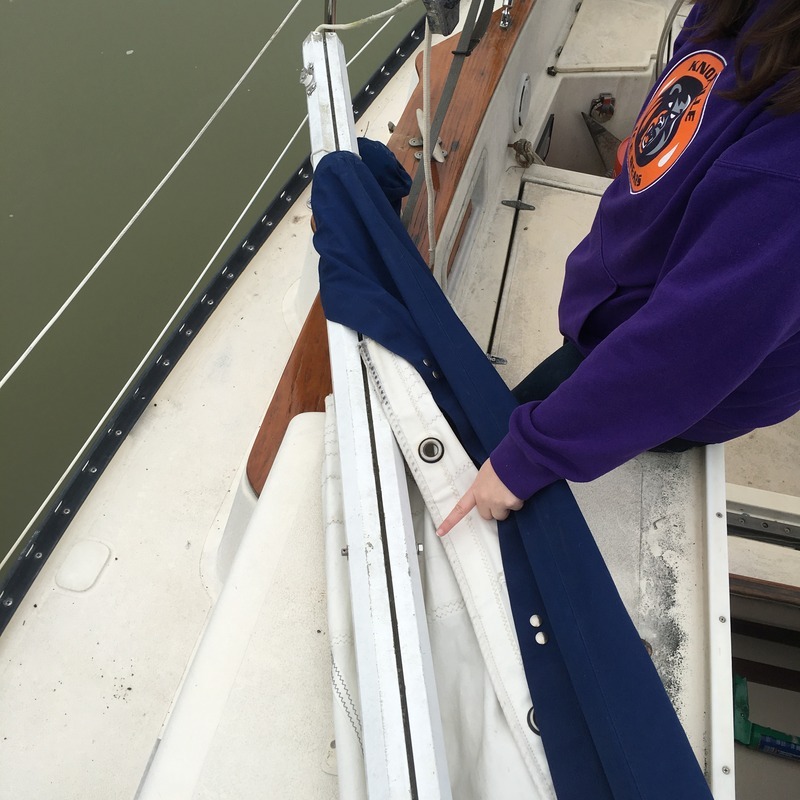 The port and starboard lines move freely (reefing lines? ), but the middle line (the out haul?) is jammed. We took the aft end cap off the boom and can see a jumbled mess of knots and at least one pulley about 5 feet foward of the aft end. 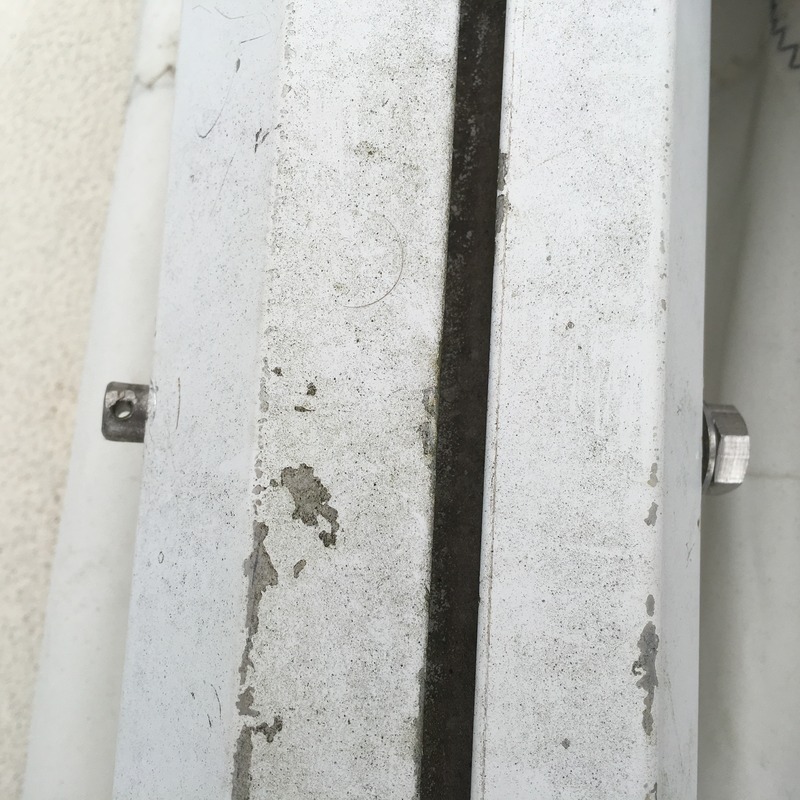 There is some kind of bolt/pin at this location going all the way across the inside that this mess is stuck on. We also took the gooseneck end cap off (by removing 6 pop rivets) but that didn't really help us. I tried to beat on the mystery bolt to remove it, and it moves a bit but doesn't want to slide through. There seems to be a metal rod attached to the section of bolt inside the boom. The rod runs perpendicularly about 3 feet aft of the bolt but still out of arms reach. I imagine this rod is preventing the bolt from moving any further. I can't imagine what its for though. Does anyone have any insight here? I think thats probably the case. I still cant fathom why this bolt/pin has a metal rod attached to it inside the boom on the port side. I put a wrench on the hex head of the bolt/pin and tried to twist. It rotated, but only until the rotation caused the metal rod thats attached perpendicularly to the pin/bolt to hit the top or bottom of the boom. I can hear the clanging inside when I do this. I beat on it pretty vigorously with a hammer but something (presumably this rod) is keeping the pin from sliding out, despite being able to move it back and forth a few mm. I'm stumped...no idea what to do from here. Do i just get a bigger hammer? Can you get a picture inside the boom? Those enscope usb cameras are quite cheap nowadays. And very handy in these kind of situations. You can connect that to your smartphone, download a app and really see what is going on in there. I’m a bit unclear on what your aim is, regarding your outhaul, & the bolt assembly in question? In my experience, it’s generally easiest to start from scratch, with most outhauls, rather than it is to rebuild what I typically find inside of a boom: A rat’s nest of stiff old lines, & gummed up, sticky blocks, etc. So if that’s what you’re thinking, I have tips on such. Ditto if you’re wanting to remove that stainless cross bolt. For that, a half a dozen solutions come to mind. Although all of them involve maiming it beyond any further use, in order to extract it (& what may be connected to it). And here are also a couple of (outhaul) resources which may prove useful. PS: This just popped into my head now. But if you can borrow (or buy) a bore scope, in 5 seconds it's give you a Crystal Clear picture of what the setup in there is. Although a powerful flashlight, & using one side of a pair of bino's might work too. -> A Bore Scope being a Fiber Optic camera/lens, with a built in light, on the end of a fixed or flexible wand (of varying lengths). Still, You're best bet/choice, will likely be to cut the bolt, & move forward. I recommend heating up this pin you show running through the boom until it is as hot as can get it. Map gas or oxy acetylene. Then put the biggest wrench you can find on it and break it loose from the perpendicular rod. The bolt most likely goes through an eye on the end of the rod, and there is probably a block on the end of or sliding on the rod. The 'mess of knots and at least one pulley' is the tackle for the outhaul. With persistence (and a bit of hyd fluid or wd-40 trickled along the bolt and soaked for a while) it should come free, then all this should come out the end of the boom. It will be worth it to remove this gear, free it up and reinstall it. You might wish to make a larger eye in the rod so it does not jam up in the future. If it were me, after soaking it I would put a wrench on it, put some pressure on it once the rod stops against the boom, then have someone tapping on the bolt end while I increased torque, it will come free eventually. On our Pearson 10M with internal multi-part outhaul there is a mid boom thru bolt that anchors one end of the multi part tackle. The bolt runs thru an aluminium compression tube inside the mast. To install the compression tube the manufacturer welded an extension on to the compression tube that can be reached from the end of the boom. In the case being discussed a wooden dowel could be used to extend the extension to the compression tube, the dowel being removed once the tube is installed. I suspect the aluminum compression tube is frozen around the stainless bolt by corrosion and will need lubrication and mechanical vibration to loosen the tube enough to remove the bolt. Heat from a torch would likely damage the lines inside the boom making their removal more difficult. [QUOTE=captmikem;2053873]The bolt most likely goes through an eye on the end of the rod, and there is probably a block on the end of or sliding on the rod. The 'mess of knots and at least one pulley' is the tackle for the outhaul. ...I beat on it pretty vigorously with a hammer but something (presumably this rod) is keeping the pin from sliding out, despite being able to move it back and forth a few mm. I'm stumped...no idea what to do from here. Do i just get a bigger hammer? If you note the photo, there is no nut and no threads, it is pinned. Penetrating oil is the best, but many folks do not have any around, hyd fluid and wd-40 are not the best, but will help. Worst case, get a Fein or Bosch multi tool and cut the sucker in half through the slot in the boom. Chances are the vibration will loosen it before you get very far. My guess is there are dissimilar metals involved. I suspect what you describe as an internal rod connected to that pin is actually an aluminium track on which slides a car with turning block.